What’s all the hype about Brooklyn? In case you didn’t know, Brooklyn has become one of the most desirable places to live in the country. It’s also become not so affordable, but that’s another story. With Prospect Park at its heart, charming brownstone-lined streets, a slew of indie boutiques, and a locavore mentality, Brooklyn is the place if you’re cool or trying to learn how to be cool. That being said, wherever you have coolness, you most certainly have beautiful interiors. Let’s take a peek at six fabulous Brooklyn bedrooms. This traditional bedroom pulls out all the stops –– rich, hardwood floors, a bold accent wall, and classic furnishings. I want to note the size of this room, which is in a house and not an apartment. This space is sprawling compared to most NYC bedrooms. 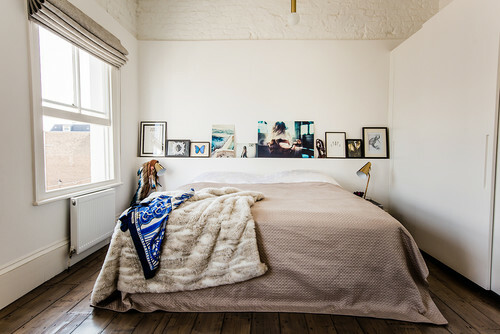 This loft bedroom has a real Bohemian feel. Notice the lack of a nightstand, but a ladder instead. The relaxed space is a great example of a casual design that is well thought out. Sleek and chic, this bedroom is a One Brooklyn Bridge loft. Notice the fun pillows and the out-of-scale accessories. This space has a very retro aesthetic. 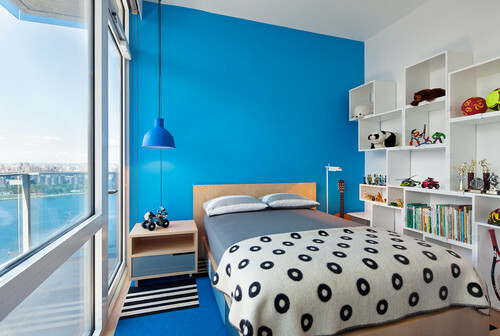 A bright blue bed wall sets the tone for this space in a contemporary Brooklyn penthouse. Storage is cleverly built into the design of this boy’s bedroom, which can easily double as a guest room. This crisp master bedroom in a Brooklyn brownstone keeps the design and details simple yet luxurious. The arrows above the bed might be the most interesting art choice that I’ve seen to date. How sweet is this bedroom? If you love lavender, you have serious envy by now. Although the colors and flowers lend femininity to the room, this romantic space could easily be a master bedroom. One of the things I love about my kid is how open he is to all genres of fiction. We have read everything from Harry Potter to Because of Winn-Dixie and from Greek mythology to tales of brave animals. None of it seems to be outside of his realm of interest. 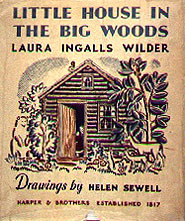 So I decided to test the limits of his attention and began reading to him the story of a little girl and her family living in the middle of the woods in pioneer-era Wisconsin. The outcome? He enjoys it! We haven’t discussed the finer points of what appeals to him but every time I think it’s too boring to carry on reading, he asks me to read him a little bit more. I have only watched the television series “Little House on the Prairie” and have never read these books before so it’s educational for all of us. What I find interesting is the didactic tone the book takes, though I find a lot of books of that era are a little bit preachy. Discussing the novel with my brother, we both agreed that some passages seem designed specifically to tell kids these days how much better they have it. And it’s true; I can’t picture my son spending every Sunday reading catechism and quietly reflecting. He can barely read for 20 minutes without asking 20 times if he can stop reading! It’s a fascinating look at daily life in the frontier wilderness of Midwest America. She certainly spares no details in everything from the process of curing meat to churning butter and cleaning a rifle. And yet, it’s interesting. It definitely gives you some perspective on what “hardship” might mean. I, for one, wouldn’t mind visiting that time for a little bit but come the Sabbath, I’d need to get online. Great family bedtime reading to fill your dreams with wildcats, bears, and log splitting. Bedroom Design: Is a Headboard Necessary? A headboard gives a space a more polished look, and it’s often an essential ingredient in a bedroom’s overall aesthetic. But the question remains, is a headboard really necessary? Personally, I love an upholstered layer between the wall and my head, but a lot of people looking to streamline their design prefer no headboard at all. Let’s take a look at some successful bedrooms that don’t seem to miss a beat even though they’re sans headboards. 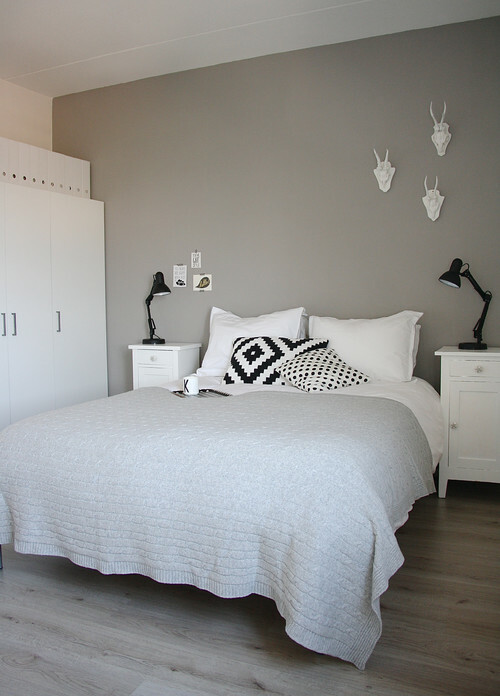 This minimalist bedroom in Amsterdam plays on whites and grays with touches of black. Bedside lamps take on a sculptural quality against the stark backdrop. The room has a Scandinavian feel. I don’t miss the headboard in this Melbourne, Australia bedroom. 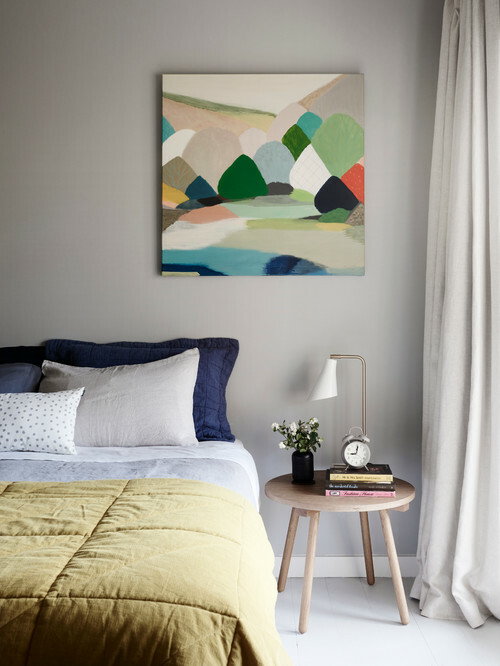 Artwork hangs low, and the darker shams almost trick the eye into thinking there’s a headboard, even though there isn’t. 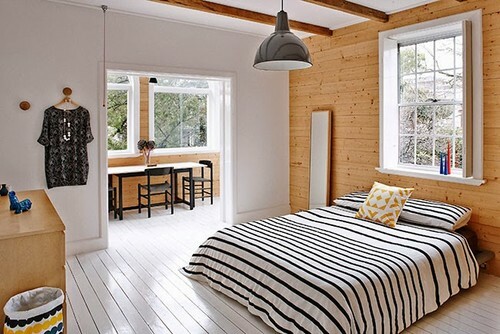 A summer cabin in Sydney uses plenty of stripes –– the floor pattern, window paneling, and bedding. With this room layout, not using a headboard was the best choice considering the window is in the center of the bed wall. The other option would’ve been to cover the window with fabric, creating a softer background for a headboard. This London bedroom’s decorated ledge gives the illusion of a headboard. The colorful artwork makes a statement in this bright, airy room. Tony Ivey & Associates used an oversized bolster as a makeshift headboard in this Albuquerque bedroom, which also has a Scandinavian feel. 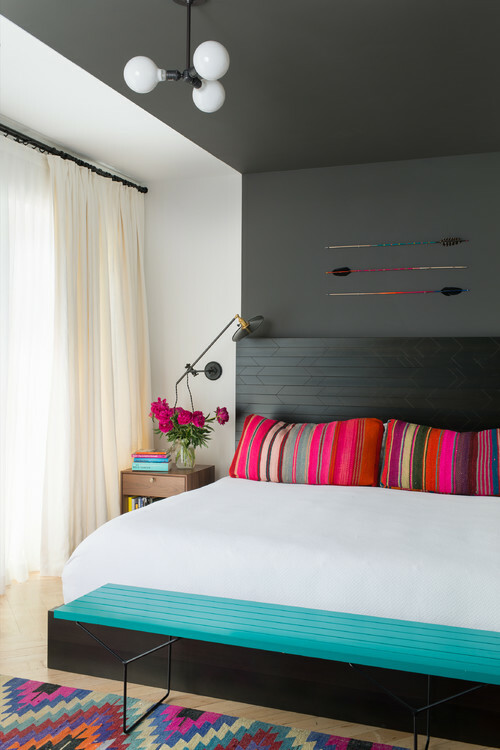 No headboard lends itself to this uncluttered, modern design. If you associate check patterns with country, you’d be correct, but that’s not the only decorating style where they can be used successfully. Checks come in all sizes and colors, and depending on their application and the other elements in the room, they might pull together a modern, traditional, or eclectic design. I’m a fan of checks when paired with other patterns, or if they’re bold and really make a statement. Let’s take a peek at some checks in bedrooms. I think you’ll be pleasantly surprised how chic checks can be! This Alabama bedroom is delightful, isn’t it? 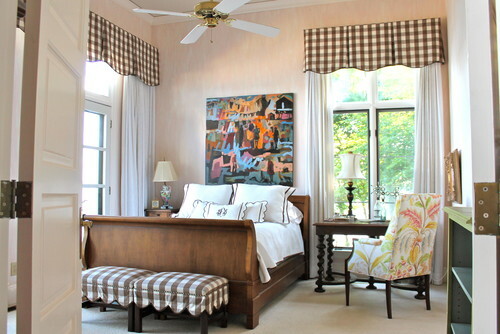 The gingham check on the window valances and footstools offers the right amount of structure. This room shows us how to mix the modern and traditional. I adore everything about this tailored bedroom. 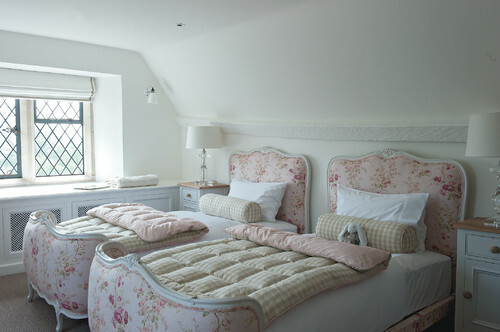 Sweet and delicate, this Cotswold Manor juvenile bedroom feels feminine with its pink, white, and beige color scheme. The check complements the floral perfectly. An impressive example of a modern country bedroom, this room has only the bare essentials, yet there’s something incredibly soothing about it. 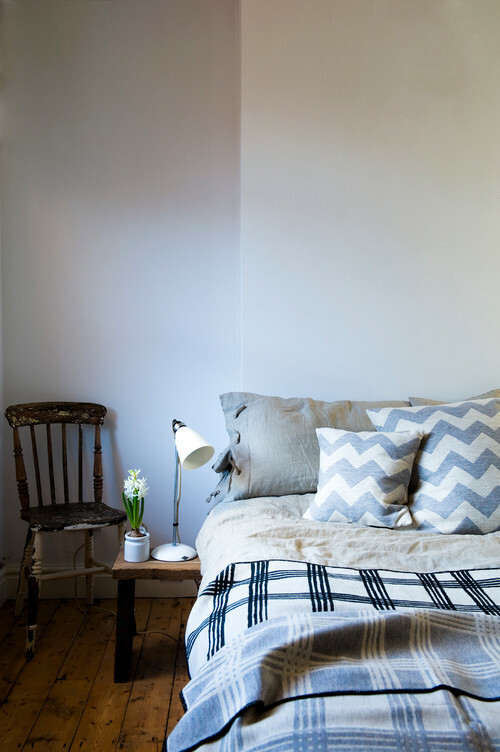 The large check on the bed covering looks terrific with the muted chevron on the accent pillows. A check area rug isn’t the most obvious choice for a floor covering, but I believe it helps complete this bedroom. The red lacquered door and the quilt at the foot of the bed help tie everything together. 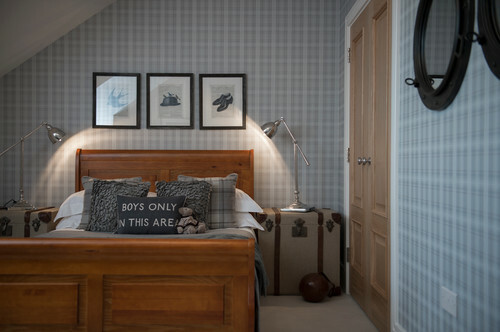 Another modern country home boasts a charming boy’s room with a check on the walls. The wall covering creates an ideal backdrop for the simple furnishings and accessories. Can’t find the check? This cozy bedroom has subtle check patterns in the shams and the textured matelassé coverlet. 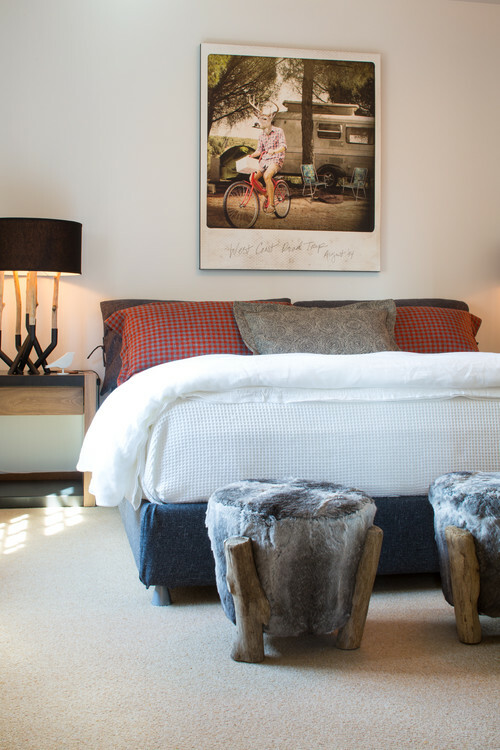 The faux rabbit, timber stools and artwork above the bed add surprise to what would otherwise be a pretty dull space. I think of this room as funky yet rustic. 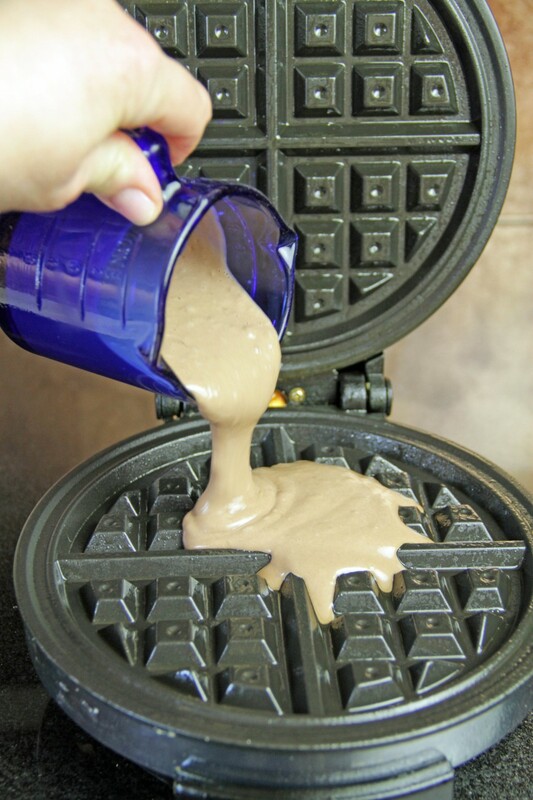 Go dust off your waffle iron and whip up some morning magic! These lightly sweet, chocolatey treats take only a little effort, and are sure to delight both young and not so young. A touch of cocoa powder in the batter is enough to provide a hint of decadence – great for brunch or special occasions. Make sure your waffle iron is well-heated before you begin. Each waffle will take about 5 minutes to cook. If you’re planning a big breakfast shindig, preheat your oven to low and then turn it off. 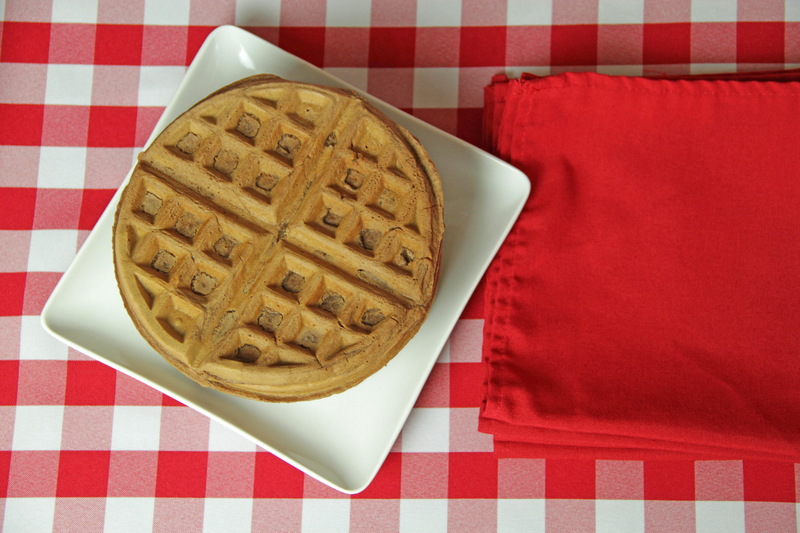 Pile each waffle onto an ovenproof plate as they finish, cover them with a light tea towel, and keep them warm until you’re done cooking. No need to waffle on this one – all it takes is a little alchemy to produce a bewitching breakfast in bed. 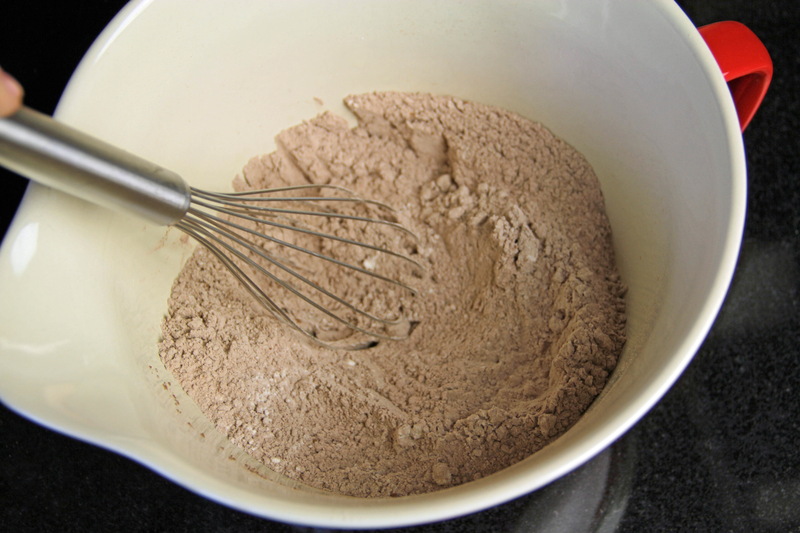 Combine flour, cocoa powder, brown sugar, baking powder and salt in large bowl. In separate bowl, add milk, eggs and vanilla and beat until frothy. Pour oil into liquid mixture and stir well. 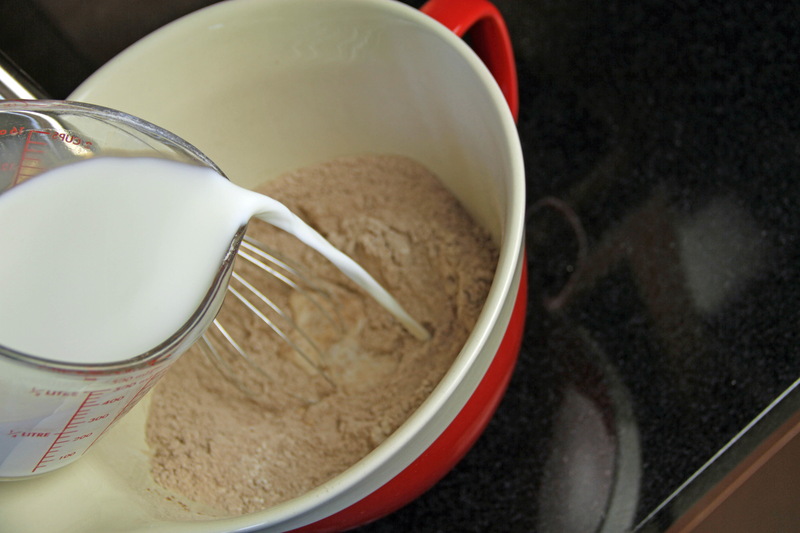 Using a wooden spoon or hand mixer, gradually add liquid mixture to dry ingredients until batter is smooth. Stir in sour cream. Spray waffle iron with cooking spray and heat to high. Pour ½ cup to ¾ cup batter into center of iron, making sure you have enough batter to evenly spread across the surface of your waffle iron. 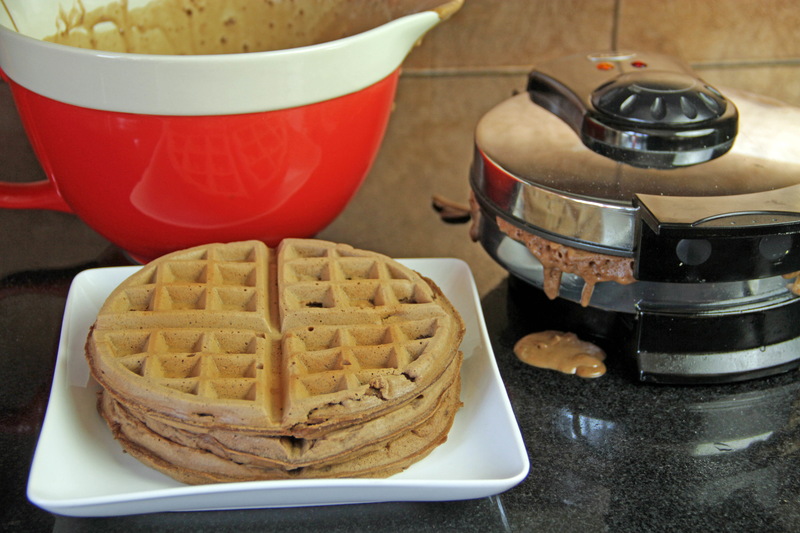 Cook until waffle is deep brown and crisp, and pulls away easily from iron, about 5 minutes. Serve warm with melted butter and maple syrup or chocolate sauce. Top with fruit, if you like.